Bhedaghat is about 20 km far from the main city of the Jabalpur. It is located near the banks of the river Narmada which is one of the ancient and historical river in India. There are several picnic and favorite tourist spots like gleaming marble rocks, natural beauty, boating spot etc. This place have significance coverage in the movies like Ashoka lead role by the Bollywood actor Shahrukh khan and 1960s movie, Jis Desh Mein Ganga Behti Hai. Named after its visual effect Dhuan means smoke and dhar means the flow also known as Dhuwadhar . It is another tourist attraction with Bhedaghat. The total height of the Dhuandhar waterfall is about 30 meters which is located in the banks of the river Narmada. The view of Dhuandhar waterfall can be enjoyed through rope way drive while one can shop marble showcased pieces. Once should not forget that it is one of the great place for photography. Madan Mahal Quila also known as Madan Mahal kila and Madan Mahal Fort is located in the city of Jabalpur. It is one of the well known ancient historical Durgavati fort which was build in the 11th century AD. The fort is associated with the Gond Queen, Rani Durgavati and her son, Madan Singh. It have well fortified walls, reservoir, war-room and many admiring things to see. 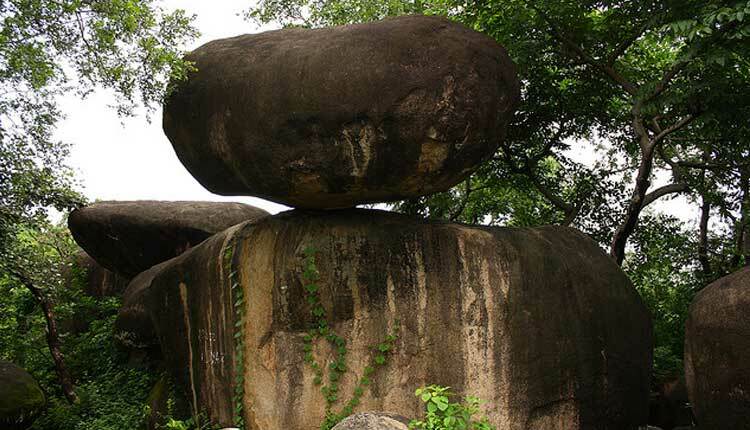 One should not forget see The Balancing Rock which is one of the huge stone balanced on the tip another rock. It is named after the 64 statues of female yogi, Chaustat means 64 in English and Yogini means the lady who proficient in yoga or the female yogi. According to historical the temple was build in the 10th century AD by the rulers of the Kalachuri dynasty. The temple is located on the top of the hill with steps nearly around 150 to climb to reach the temple. It have the idols of lord Shiva, Mother Goddess and a very beautiful look of the sunlight from the inside of the temple and a lots of ancient admiring things to see. Dumna nature reserve park in located near the Dumna airport. It is one of the exotic ecotourism spot to visit which is beautified by the Khandari Dam constructed by the Chief Commissioner of Central Provinces and Berar, J.H. Morris in 1883. The Dam was build with the purpose to supply clean drinking water to the city of the Jabalpur and nearby areas. According to the Dam Authorities in India there are around 3o major dams are constructed on the river, Narmada in Madhya Pradesh. This dam was build with the purpose to supply irrigation water and generate hydroelectricity to supply electricity in and around Madhya Pradesh. Tourist can enjoy water-sports at the Bargi Dam in the Narmada River. While going towards Bhedaghat or coming Bhedaghat towards the Jabalpur city one can visit the Trupur Sundari Mandir. According to the Jabalpur Govt. Portal this template was build in the 11th century which is about 5 km away from the main road towards Bhedaghat. The temple have idols of goddess Tripur Sundari Devi that has emerged from the ground and devoted by the people and the rulers of the Kalchuri dynasty. Gwarighat is a small-town located on the banks of the river which is 8 km far from the main city of the Jabalpur. This place is used as the holy bath spot by many Hindus. Maa Narmada Aarti is well-known in and around the Jabalpur. People from various parts of India visits this place occasionally to worship goddess Narmada and to have holy bath in the river.